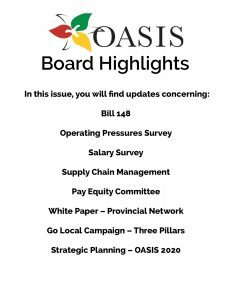 We would like to introduce you to the new OASIS Board Highlights Newsletter! This will be a regular publication that will be sent after OASIS Board meetings. It covers some of the key highlights and presentations made at its meetings. Our aim is to keep our members informed about the goals and activities of the OASIS Board of Directors.